Hi, remember me? …. Me either. Yes, I’ve been gone forever! Forgive me! It’s been a crazy summer, one whole month of which was spent traveling to four different states, all over the country (Washington, Maine, Massachusetts & Tennessee, if you’re curious). I’ve been meaning to update my blog for weeks, but me being a classic 9 on the enneagram (if you’re not familiar with the enneagram, google it! It’s fascinating. I am a 9 down to a tee! ), I have trouble getting things started back up once I haven’t done it for awhile. But thanks to the encouragement of many friends, I’m back in action. 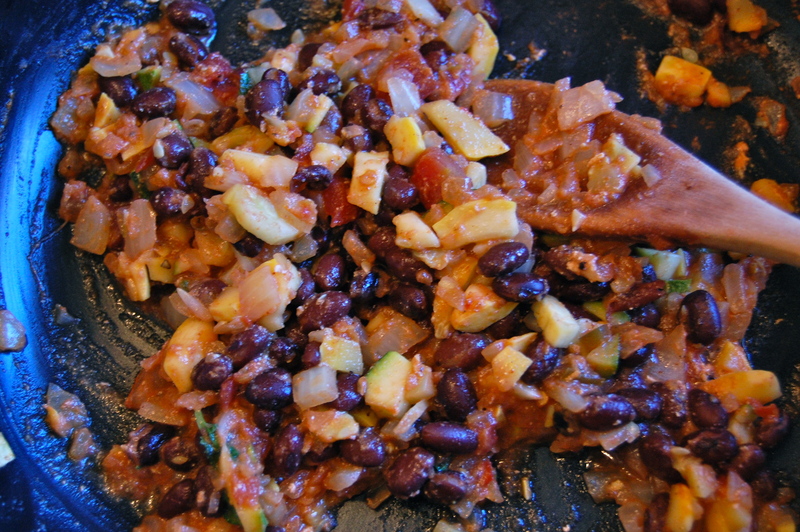 For a quick lunch today, I rustled up some leftovers: black beans, summer squash, zucchini, salsa, and corn tortillas. It made for a delicious, easy, and filling lunch. I didn’t measure anything, so these are rough estimates. Change it up as you please. Sauté squash, zucchini, and onion with the oil. Add some salt & pepper, and your spices. Cook for a few minutes, stirring often, until onions are soft. Stir in the beans, salsa, and yogurt. Turn the stove off and keep the pan on the burner to stay warm. Now grab another pan to heat the tortillas, and turn heat to med-high. Heat each corn tortilla on each side until soft. If you have a gas stovetop, you can actually just hold each tortilla over the flames for a few seconds so they get a little crispy. My friend grew up in Ecuador, and he tells me this is how they do it in South America… much more auténtico. 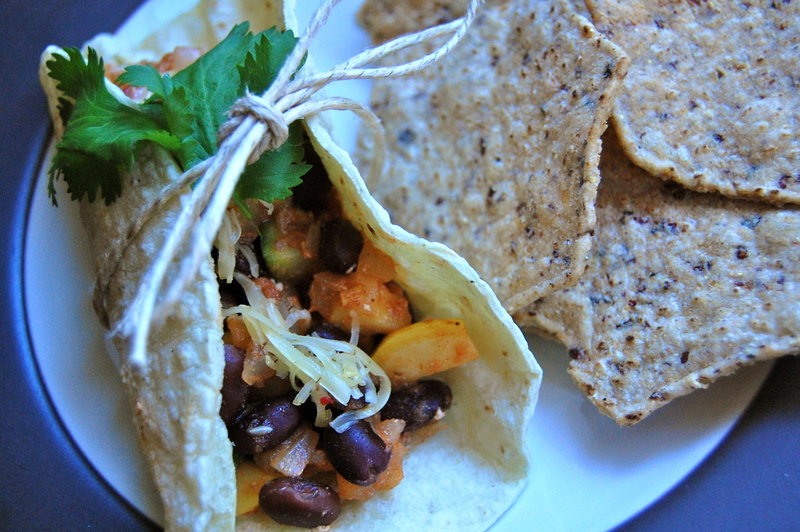 Fill each tortilla with a little bit of the squash & black bean mix. Top with cilantro and shredded cheese. Enjoy! When I was in college my friend Lauri (Hi, Lauri!) introduced me to her Dad’s delicious taco recipe. At the time I was skeptical, because I saw as she was making it that she put raisins into the mix. I’m not a huge fan of raisins, so I was doubtful that this would taste any good. But let me tell you something, it was more than good. It was delicious. 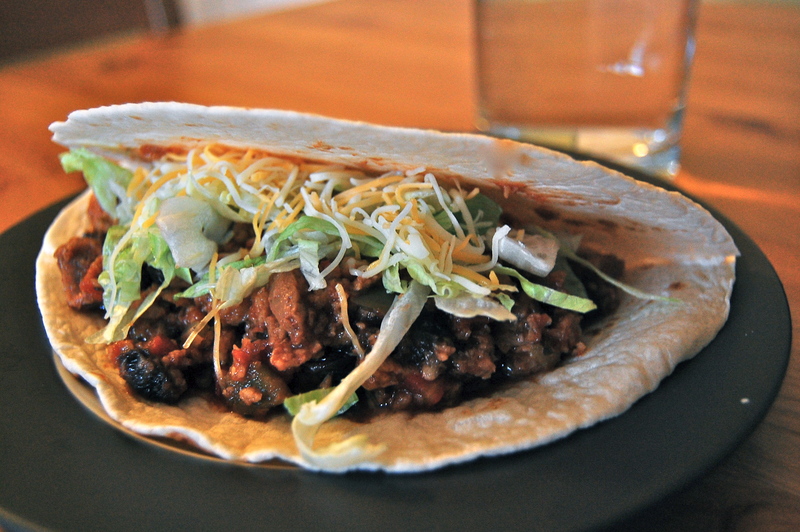 The raisins plump up when you cook them and add a sweetness to the taco mix that you’re not expecting. Once you try it, you’ll never go back to raisin-less tacos. I love this recipe because it is so quick and easy. It’s great for when you don’t have a lot of time, or don’t feel like spending forever in the kitchen prepping a meal. 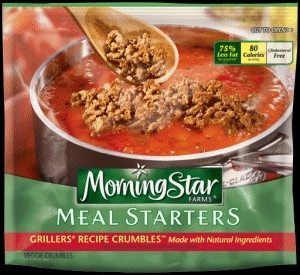 The original recipe calls for ground beef, but I use Morningstar Farm’s grillers recipe crumbles. If you’re looking for it in the store, head to the frozen section. Here’s a picture so you know what to look for. You can buy these at Target and most major grocery stores. Normally I don’t do the fake meat thing. I have committed to the vegetarian diet, and I don’t think I need to be eating fake meat every day to supplement my lack of real meat. It just doesn’t make a whole lot of sense to me. I also like to try to stick to Michael Pollan’s food rules, one being, “avoid food products containing ingredients that no ordinary human would keep in the pantry.” Unfortunately a lot of the meat alternatives have scary ingredients list a mile long with things I don’t recognize. Anyway, that being said, once in a while I will buy something like these soy crumbles to use in a recipe. Hey, sometimes the fake meat just tastes good. Everything in moderation, right? FYI — To cut preparation time and simplify the recipe, I usually just stick with the crumbles, raisins, garlic, and salsa. I don’t add onion or pepper just because those things are already in the salsa, and it’s definitely flavorful enough without them. But it’s up to you. Maybe one day I’ll actually put in some effort and try the original recipe. 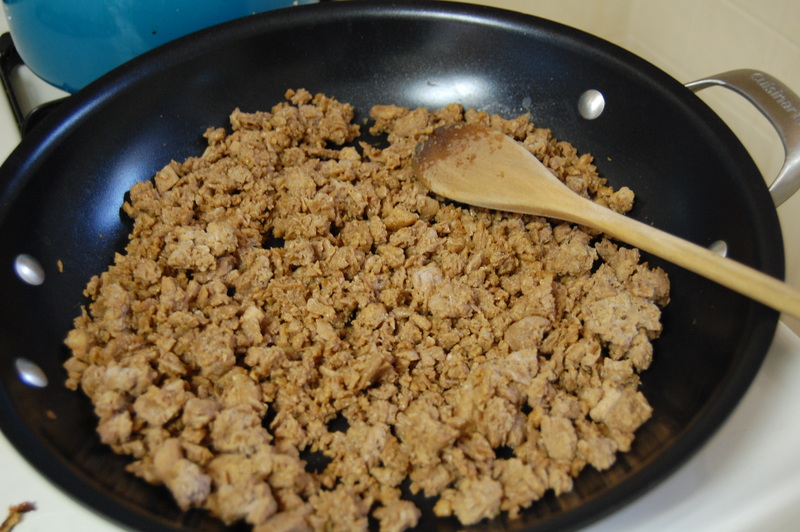 In a large skillet, cook the soy crumbles over medium heat. Cook for a few minutes until they soften up and are heated through. Add raisins, onion, pepper, garlic, salsa, and water. 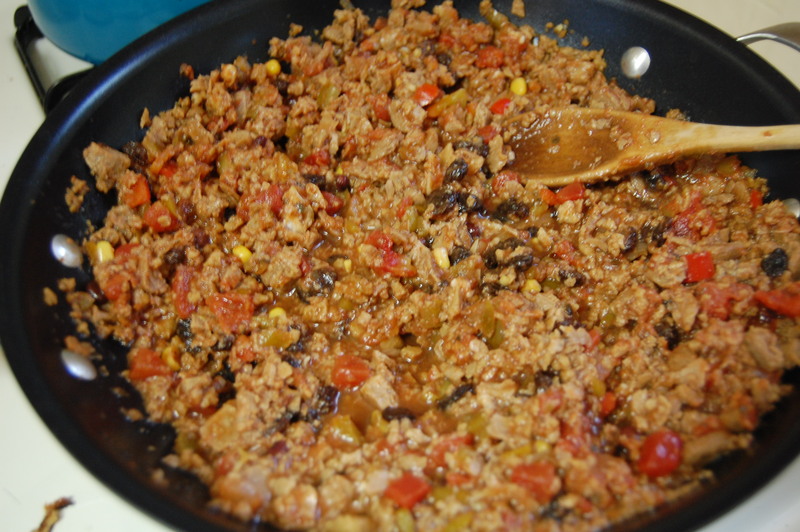 Simmer until onions and peppers are tender, and sauce has reduced to a thick consistency.